In order to get your Museum Member discount, please login to the website using the email address that the membership department has on file for you. The first time you login, the password will be your membership number. You will have the option of changing your password once you are logged in. What if I do not have an email address on file? If you are not sure if there is an email address on file for your membership, please email us, store@museumofflight.org, and we will be happy to verify the information. If there is not an email address on file, we will be happy to assist you with adding an email. What is the member discount? The Museum of Flight member discount is 15%. How can I purchase a membership online? If you would like to purchase a membership to the Museum or purchase a gift membership for someone, please visit our Museum of Flight website, http://www.museumofflight.org/membership. 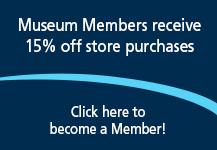 What is the difference between a Museum Membership and an account for the Museum Store? Members of The Museum of Flight have purchased a yearly membership to the Museum. An account for The Museum of Flight website saves your shipping address and other preferences. For more information on The Museum of Flight memberships, please visit http://www.museumofflight.org/membership. Yes, we ship to most international addresses. Orders shipped to international addresses will be shipped using the US Postal Service. Yes, we ship to all military addresses. Do you ship to PO Boxes or Rural Routes? Yes, your order will be shipped using the US Postal Service. Orders placed online or over the phone with the Museum Store can only be shipped to one address. If you are purchasing gifts to be shipped to multiple addresses, please place separate orders with different ship to addresses. When your order is processed, you will receive an email with the tracking information from either UPS or USPS. If you have any additional questions or concerns regarding the status of your order, please email us at store@museumofflight.org. If you need to cancel your order, please email us at store@museumofflight.org. We process orders Monday through Friday. Who can I talk to if I have questions about placing an order online? If you have any questions about placing an order, feel free to contact the Museum Store by phone at 206-764-5704 or email us, store@museumofflight.org. Can I return or exchange an online purchase in person? Yes, you can return or exchange an online purchase in person. The Museum Store is open daily from 10am until 5pm PST. Please make sure to have a copy of your receipt with you for the return or exchange. If you would prefer to place your order over the phone, please call the Museum Store at 206-764-5704. The Museum Store is open daily from 10am until 5pm PST. The Museum of Flight Store is open daily from 10am -5pm along with the rest of the Museum. For more information about visiting the Museum, please see our Museum website, http://www.museumofflight.org/visit. We do have more than 1 location. Our main Museum Store is located at The Museum of Flight on Boeing Field in Seattle. We also have a small store location at our Restoration Center in Everett on Paine Field. For more information on visiting our Restoration center, please visit http://www.museumofflight.org/restoration. Are all of the items in your store online? At this time, we do not have every item we carry in the store online. If you are looking for something and you do not see it online, please call the Museum Store at 206-764-5704 or email us at store@museumofflight.org. How do I sign up for the Store Newsletter? To sign up for the Museum Store newsletter, please see the newsletter signup at the bottom of the page. We do not offer a catalog. At this time we do not offer gift cards online. If you would like to purchase a gift card for use at The Museum of Flight, please call our Museum Store at 206-764-5704 and any of our sales associates will be happy to assist you. At this time, we cannot accept gift cards as payment online. Can I use my Boeing points in The Museum Store? We are not a part of the Boeing Company and we cannot take Boeing points as a form of payment in our Museum Store or on our Museum Store website. The Museum of Flight accepts Visa, MasterCard, American Express and Discover Card for payments.